Microsoft rolls out two Windows 10 feature updates a year. In April, the Creators Update arrived, followed by the Fall Creators Update this month. In order to reduce the number of problems big updates like this can cause users, Microsoft staggers the rollout. Fans and early adopters get it first, then comes the initial phase, where the update is made available for newer systems, followed by full availability. This, in theory, is a smart move. Microsoft can monitor the rollout, and if things are going smoothly, make the update available to more users. The problem is, with the Creators Update the rollout took forever. To be frank, the previous rollout was a mess. Two weeks after it began, Microsoft warned users not to manually install the Creators Update, and to instead wait until it was offered, because it was causing too many problems. Three months after the rollout started, Microsoft announced it was now available to all. Great news, except it wasn’t. Just last month, a quarter of Windows 10 users weren’t on the Creators Update. Which is a pretty major problem, given the Fall Creators Update is here now. Thankfully, Microsoft appears to have learned its lessons, and is making the latest feature update available to a greater number of users from the get-go. According to Microsoft’s John Cable, Director of Program Management, Windows Servicing and Delivery, "With this feature update we’ve increased the number of Windows 10 devices we’ve tested in advance with our OEM device and ISV app partners." The goal, Cable explains, is "to deliver feature updates to you as quickly as possible, while providing you with the best possible update experience." 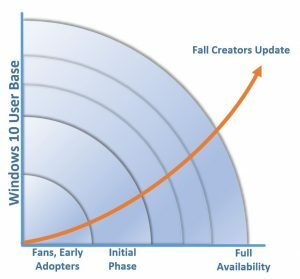 He doesn’t reveal how many more users are being offered the upgrade in the initial phase, but one of my computers which took months to get the Creators Update was offered the Fall Creators Update last week (and it's running fine). In addition, the download size for feature updates has been reduced. If you upgrade the Creators Update to the Fall Creators Update, differential downloads mean the update will be approximately 25 percent smaller. The rollout rate will be based on how well the Fall Creators Update performs on those systems which get it. If too many issues get reported, Microsoft will throttle the speed until the problems are fixed, and it’s safe to make it available to more users.